Plan CreationPlan DetailsPlan FinanceRank Plan and Rank wise Self anddown line commissionUnlimited Branch CreationBranch loginBranch activitya. Create agentb. Create customerc. Agent payoutd. Customer payment and withdrawale. Agent self & down line earningsf. Agent Joining letterg. Agent pay sliph. Customer receiptsi. We provide Complete Banking Software. The Complete Software is Online. All you need is a Computer and an Internet Connection. Any Device Any Where Access. 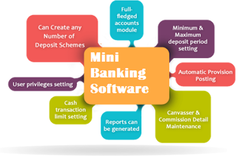 We offer Banking Software Services.We provide these services which are applicable in all kinds of banks.These Software are installed and give a great business solution. This banking software is being used in many co-operative societies It's a complete solution for employee credit co-operative societies. Rural Banks, since their inception, have been deep rooted and have become the backbone of rural credit structure. Over the years, these banks have played key role in rural institutional financing which is critical to development of the rural economy.